The team of Charlie Gillan, Stan Sieler, Brian Hart, Willie Franklin, and Mark Attwood put together the most entertaining routine from a bag of "junk". In addition to the awards given for specific contests held throughout the year, Ring 216 honors those members who have demonstrated notable accomplishments in the art of magic or who have made special contributions to the success of our club. A descriptions of these awards is detailed below. The list of past award recipients can be viewed here. The competitor who wins first place in at least two competitions for a given year will be awarded Magician of the Year. If no competitor wins at least two of the annual competitions then the Magician of the Year will be awarded based upon a detailed list of criteria. The criteria are divided among the following categories: demonstrated leadership in competitions, performances, mentorship, self- development, and promotion of our Ring. When possible, the winner of the Magician of the Year Award will be announced at the end of the calendar year via email. Otherwise, the announcement of the winner will be made during the awards ceremony of the following year. The lifetime achievement award is presented to a Ring 216 member in good standing who, over the years, has achieved notable recognition in the art of magic. To qualify as a candidate for the award, a nominee must have accumulated a minimum number of points as established by a spreadsheet calculation (available on request) and certified by an awards committee composed of the Ring officers. If more than one qualified candidate is nominated, then the candidate with the most overall points will receive the award. When possible, the winner of the Lifetime Achievement Award will be announced at the end of the calendar year via email. Otherwise, the announcement of the winner will be made no later than the January meeting of the following year. 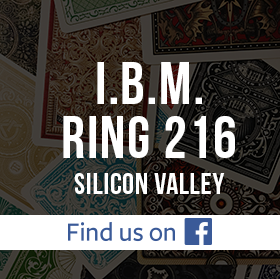 The Outstanding Contributor Award shall recognize the individual member who has made the greatest contribution to the benefit and good of San Jose IBM Ring 216. Providing personal time over and above that required or expected to lead and organize club functions. Putting in an extra effort of time that results in successful functions. Help members improve their magic abilities and advance the Art of Magic. Volunteer participation or involvement providing guidance, leadership or mentoring to a substantial portion of the Ring membership. Recognition of the above efforts shall involve at least three years of continuous membership in Ring 216. When possible, the winner of the Outstanding Contributor/Mentor Award will be announced at the end of the calendar year via email. Otherwise, the announcement of the winner will be made no later than the January meeting of the following year.